Upper Deck has its sights set on a return to the golf world sometime soon and a pair of future products will include a golf card first and a big batch of Tiger Woods. Those are things that golf fans — who have been without a set of their own since 2005 — will undoubtedly appreciate. Up first, is a first — Bubba Watson‘s first Upper Deck golf card. It will appear in 2011 Goodwin Champions, which will arrive later this year. Upper Deck’s Sports Marketing and Social Media Manager Chris Carlin had additional details. “We’ve reached a deal with the 2011 Farmers Insurance Open winner for image rights and autographs,” he said. “That’s kind of big news as many were wondering if we would ever produce Goodwin Champions again. The last Goodwin Champions set had a lot of very unique and innovative trading card inserts sets, so we are very excited to bring that product back with even more bells and whistles that will be announced in the coming months. The second item — a whole lot of Tiger — can be seen after the jump. Upper Deck officials recently unveiled preliminary information and images for the company’s newest multisport product, Upper Deck World of Sports, due out in December. As you might imagine, the product’s key calling cards will revolve around longtime company exclusives Michael Jordan, LeBron James and Tiger Woods. But the product also is slated to includes stars from such sports as baseball, hockey, soccer, mixed martial arts, extreme sports, Olympic sports and even lacrosse. The 400-card base set is bolstered such insert sets as Athletes of the World Signatures, Sports National Dual, Triple and Quad Signatures, All Sport Apparel and Clear Competitors. 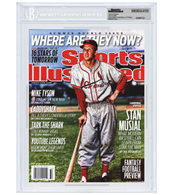 In addition to including a stable of traditional signature inclusions (Jordan, James, Woods, Sidney Crosby, Wayne Gretzky), the preliminary World of Sports autograph checklist also calls for the likes of Pete Rose, figure skaters Nancy Kerrigan and Sasha Cohen and MMA legend Randy Couture. Product promotional literature promises an average of two autographs and one memorabilia card per box (and one multi-signed card per case). Stay tuned to Beckett.com for additional information on this product. As one of the only companies that stood by Tiger Woods during the scandal-laden treachery of his last four months, Upper Deck was understandably thrilled by his ballyhooed return to competitive golf at this week’s Masters. Woods’ fired a like-he-never-left 4-under 68 in Thursday’s opening round that left him just two strokes off the lead — and likely added a good share of names to the waiting list for a handful of new Upper Deck Authenticated Woods items. Upper Deck‘s popular Champ’s hockey set has arrived with its eclectic mix of past and present hockey and sports stars, historical figures, landmarks and much more that help bring the old-school tobacco card aesthetic to the ice. Champ’s packs four autographs or memorabilia cards per 20-pack hobby box with names like Michael Jordan, Dan Marino, LeBron James and Tiger Woods alongside guys like Sidney Crosby. Among the inserts are “Wonders of the World,” which focuses on famous landmarks like the Taj Mahal or the Great Wall of China, “Natural History,” which focuses on endangered species and extinct creatures. Of course, also included are “Museum Pieces,” which include fossils, teeth and tools from prehistoric times embedded into the cards. See more from the set after the jump. With Tiger Woods’ first public comments about his transgressions on Friday, there will be plenty of discussion about Woods’ future with sponsors and with other business ties. His largest tie that collectors would be concerned with — his deal with Upper Deck as a company spokesman — remains secure as the company will continue to support the golfer.